Even if you are brand new to SEO optimizing your website/blog, I am sure you have already read a lot of materials on internal linking. 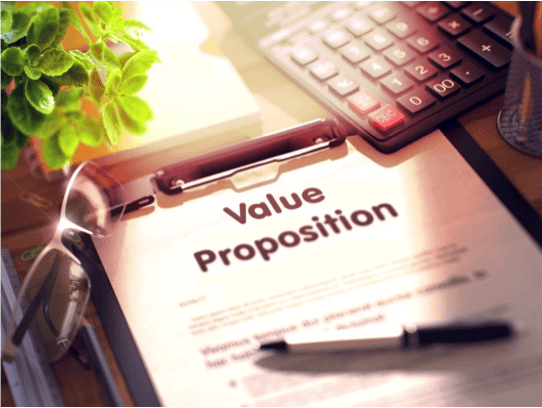 Most major digital marketing websites/blogs have published numerous articles about this topic and many SEO specialists have expressed their opinion about it in vlogs, conferences, articles etc. However, as I was holding a presentation the other day in front of a young and enthusiastic audience, I realized that there are still many preconceptions around link building and many details about internal linking strategies are not yet fully understood. This is why I decided to clarify all these things in a comprehensive article. 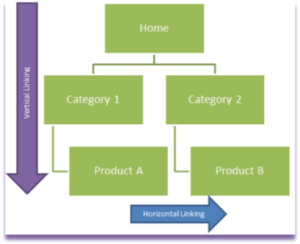 I am sure everyone knows an external (outbound) link points to an external domain or website, while an internal (inbound) link points to another page within the same website. A lot of SEO experts believe that external links pass a lot more authority and ranking ability than internal links. It’s actually believed that getting quality external links – which are seen as a vote of trust from third-party sites – is the most important objective for getting high rankings. This is why most SEOs focus on getting a high number of external links pointing to their websites and give less importance to internal linking, which actually has a lot of potential for increasing rankings and making a site user-friendly. Actually, both external and internal linking serve different purposes for content strategy and SEO, therefore none of them should be ignored. Internal links are considered a very important on-page signal over which you have total control. 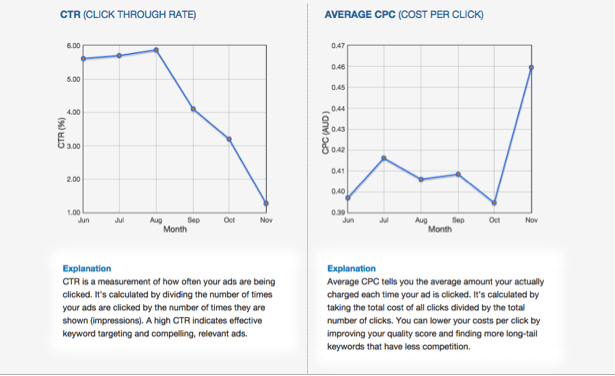 You can choose the appropriate anchor text and the right landing pages. The internal links you create will tell search engines what content you see as relevant to that anchor text, and it will help visitors navigate your website. Ignoring the use of internal links can prevent a page’s ability to get crawled and ranked by Google. For example, an orphan page that isn’t linked much or at all from the rest of the website will probably not be ranked well. 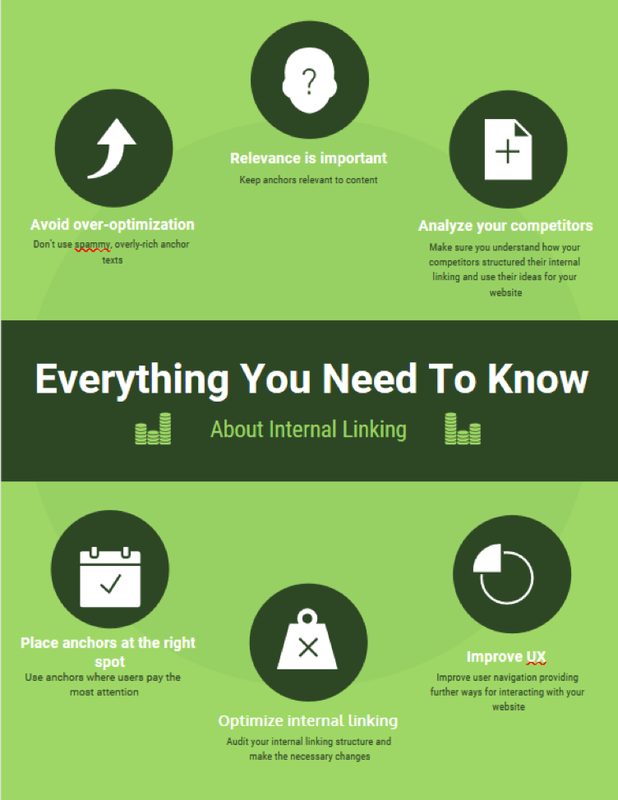 Apart from the SEO value of internal links, interlinking is also valuable to your user experience. 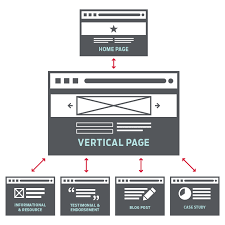 An efficient interlinking structure improves user navigation by providing further ways to interact with your site. In an interesting article published in 2016, columnist Paul Shapiro shared his method for determining what he calls “internal PageRank.” The author stresses the fact that a website’s architecture plays a major role in the way both users and search engines can navigate your website, which ultimately impacts your website’s rankings. We are dealing with two types of internal links: the links from the website’s navigational structure and the secondary internal links that appear in context throughout your website. The first thing to do when building a website is to make sure you organize the navigational links in a logical, easy to understand structure. 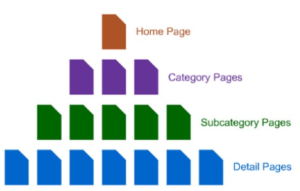 The total number of links that occur between a web page and the home page should be reduced. As it is the most important page of the website, your home page’s authority should be leveraged to spread link juice evenly throughout the website, enhancing the ranking of each web page. The internal links that appear in context also impact how the search engines crawl and rank your pages. We’ve all heard about the Page Rank (named after Google co-founder Larry Page), which defines the “importance” given to each page on the web and the rank which determines how useful that is, based on the quantity and quality of the links received from other pages. But, according to Paul Shapiro, this idea can also be applied to the pages within a single website and the PageRank-like metric can be used to detect the issues in a website’s architecture. 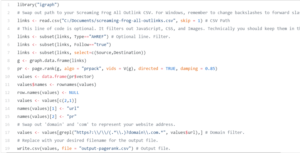 To calculate the Internal PageRank of a website, we need to crawl our website and analyse the list of all the internal links obtained with a tool like Screaming Frog, for example. You also need R, a free software for statistical computing and graphics that runs on many platforms. Looking at this list, we can see that our top page is the contact page, which is not OK. Normally, the home page should have been at the top, and this happens due to the way the way internal linking has been structured. Now that I realized we have a problem, I can work on it and find an effective solution to improve our website. The length of their articles. 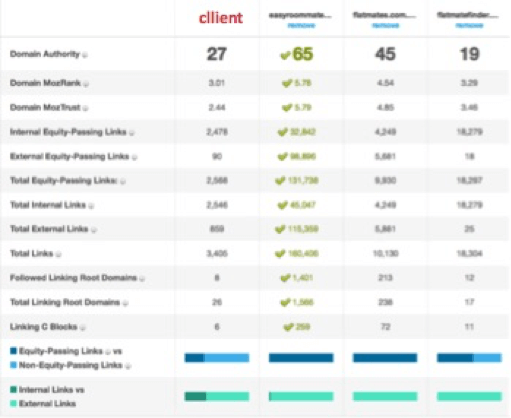 If you are preparing to build a new website, you can use this information to understand the strength of your competitor’s content and determine if you can outrank them and how much time this could take. 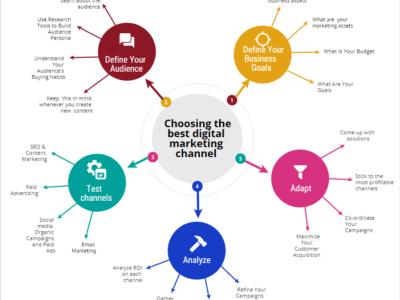 Studying your competition in terms of internal linking structure can also be useful for generating new content ideas. 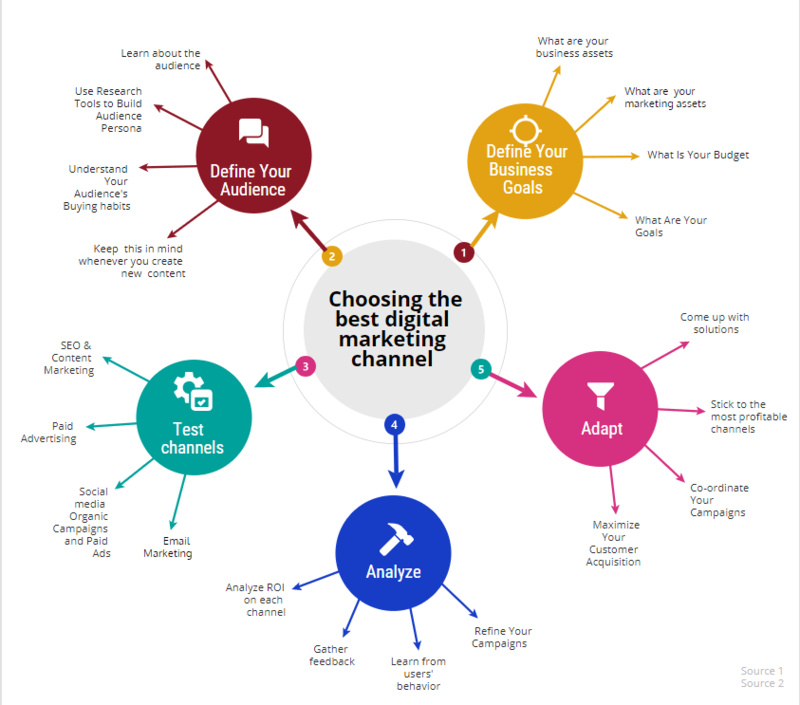 If you already have a website with plenty of content around the strategic keywords you are targeting, decide upon your cornerstone content and make sure you use your main keyword in it. As Rand Fishkin explained in one of his Whiteboard Friday articles, anchor texts of internal links generally have less influence than those of external links. It is not recommendable to use the most important keyword in the anchor text, because it won’t look credible and useful to the users, who may stop to click around the site or bounce more. Of course, not abusing the use of exact match anchor texts doesn’t mean you should stop using internal links at all. But, since the Google Penguin update in 2012, the rules of anchor text optimisation have changed a lot. Anchor text over-optimisation methods became outdated and should be avoided at all costs. According to Google’s general guidelines, linking should be kept natural and versatile. Google does not like spammy, overly-rich anchor texts, but appreciates simple, natural anchors, relevant to the content (creating keyword variations for your anchor text structure seems like a good idea). Inserting internal links in content for indexation may not seem smart, but links may also help your site’s UX. A link placed in a piece of content communicates to readers the place where they can gather more information, the pages with similar content, the way they can make a purchase or get in contact with you, which functions as a guide towards your marketing goal accomplishment. Ideally, you should place links in blog posts towards other relevant posts. These relevant links will enhance your UX and result in increased traffic and leads. It is also very important that the web pages should not contain any broken links. If they do, redirect the links to other relevant pages. Web pages should also load fast to ensure a positive user experience and to prevent off bounces. When we say link building, we often think about backlinks, which remain high on our priority list of SEO efforts. But that doesn’t mean we should overlook the UX and overall SEO value of creating a proper internal link structure. While backlinks from diverse and authoritative domains play a big role in your website’s rank, their effects can be amplified by a clear, logical internal linking structure that spreads the link juice evenly throughout your site. Business owners need to think bigger when it comes to local SEO because it’s a tight market. The problem is that SEO strategies are often layered and complex. It’s not enough to list the company in directories and forget about them, for instance. You must target key directories to get the best results and optimise them, so they are geo-specific. Local SEO takes all the regular SEO practices and builds on them to create a steady flow of loyal, but local, clientele. Is it difficult? It just takes a little know-how. 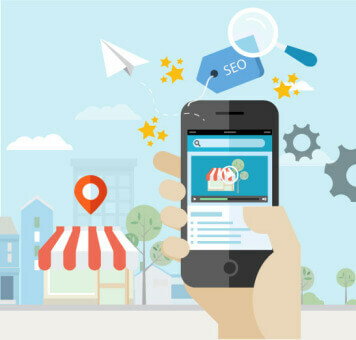 Consider seven things your local businesses can do to boost SEO. NAP stands for name, address and phone citations – they need to be consistent from directory to directory. The goal is to build trust with the various search engines because they spider through many different sites to confirm the company’s NAP. Google considers confidence when ranking pages and providing search results, so consistency matters. You can use a service such as Bright Local to get quickly listed on the mainstream directories or go through and manually add the posts yourself. You’ll need to inspect them routinely to ensure the NAP is correct and make updates especially if the business adds a location or something changes like the phone number. 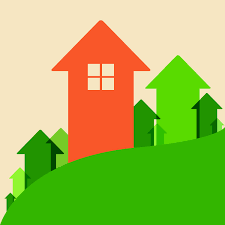 Fixing inaccurate listings is time-consuming, but well worth the effort. This adds another layer for search engines to use when verifying your information to build confidence. You want your NAP to show somewhere on all web pages related to your business whether it’s a product page, landing page or even listing for a niche blog or industry site – one consistent NAP placed on all Internet assets. Reviews on sites like Google and Yelp do more than provide information to consumers shopping for a product or service, although that is important, too. At least one survey found that 92% of consumers read and rely on customer reviews. They also add yet one more layer to your local SEO strategy. Ask your customers to provide a review. The search engine will see that local review and use it to verify the location of the business. That’s bad business for many reasons, but it is especially critical for SEO. Pay particular attention to sites like Google My Business. When you create your listing in Google My Business, you must verify your location and NAP information. Google looks at your review responses and checks to make sure the right company is answering, thereby increasing that critical confidence rating. Website testimonials count towards the in-SERP stars, which show rating stars on the search engine results page. Most major directories like Google, Yelp, CitiGrid and Foursquare show these stars as part of the result. You can use a website-based application to allow users to give your business a “star” rating, but make sure to review the platform’s policy carefully, so they work correctly. Website testimonials also impact Google perception of the business when assessing its trustworthiness and reputation, and testimonials increase the confidence of potential leads that visit the site, as well. Be sure to thank the posters that give the company high marks, and try to work out issues if you get a low rating. If your business has multiple locations, list the NAP for each one and create local schema markup for each store. The schema markup doesn’t display on the live webpage but sits in code. You’ll need to list a markup for each separate location. 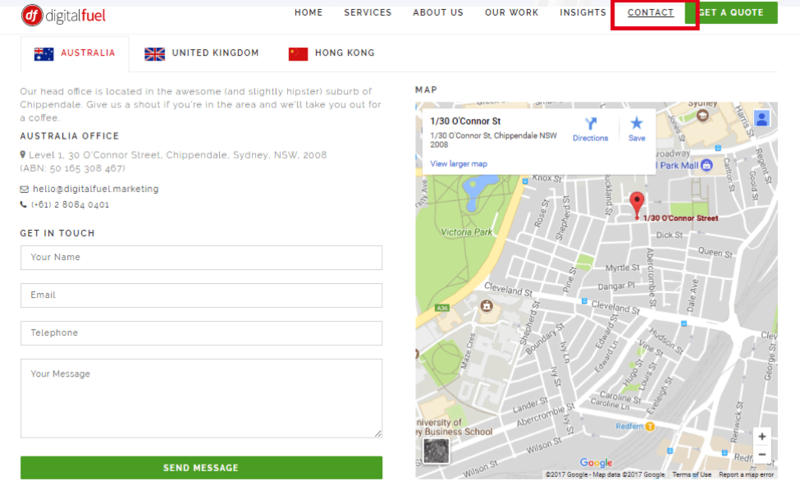 If the business has just the one location, you still need the map and local schema markup. Things like recognisable logos, security seals, location-specific organisations and critical certifications matter, as well. 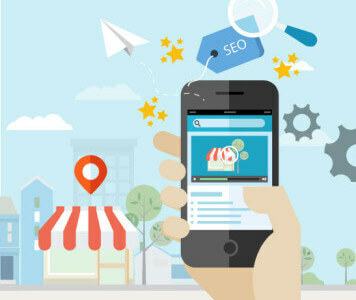 They help build your brand reputation with the consumers most likely to become customers and enhance local SEO at the same time. SEO is fiercely competitive, especially since Google dropped down from seven local listings to just three. If you focus on the main SEO factors, you increase your odds of making that list. People are limited. We cannot be all things to all individuals, and sometimes you don’t know what you don’t know. When you don’t have the right insights, your business and website will not run optimally. One of those ‘below the radar’ insights of useful websites is good link building. Too many businesses just do not understand the importance of strategic link building and suffer for it. 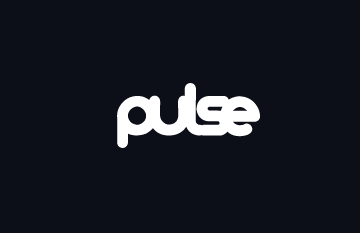 A few months ago, Pulse was engaged to assist on an exciting project. The client was one of the top flatmate sharing sites in Australia. Google wasn’t indexing internal pages. These were not the only problems. In light of all this, it was decided that a new site was to be built from the ground up. Using Moz and SEMrush tools for both Desktop and Mobile, it was found that as of August 2015 the current site had 1,253,404 broken links and other important errors. Unfortunately, the nature of this problem is that these just simply can’t be fixed until the new site is live. 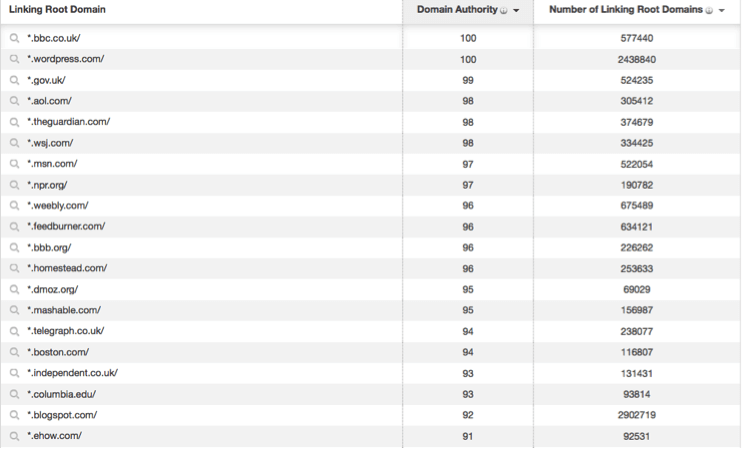 Domain authority results: The domain level stats were not great either, as can be seen in the data below. Most importantly, however, user experience was not up to date with what users expected in 2015 by way of user experience. While the site was functional and aesthetic, there were some updates of which it could take advantage, particularly noting how linked to modernity online relevance seems to be. That said the brand was still great. While there was goodwill in the brand and the domain, the priority was to build strong links and do so as soon as possible. However, link building can be a labour of love, and it takes time; in this case, there was no time to waste. we identified a search market in Australia of 100,000 searches a month within a group of at least 500 keywords. 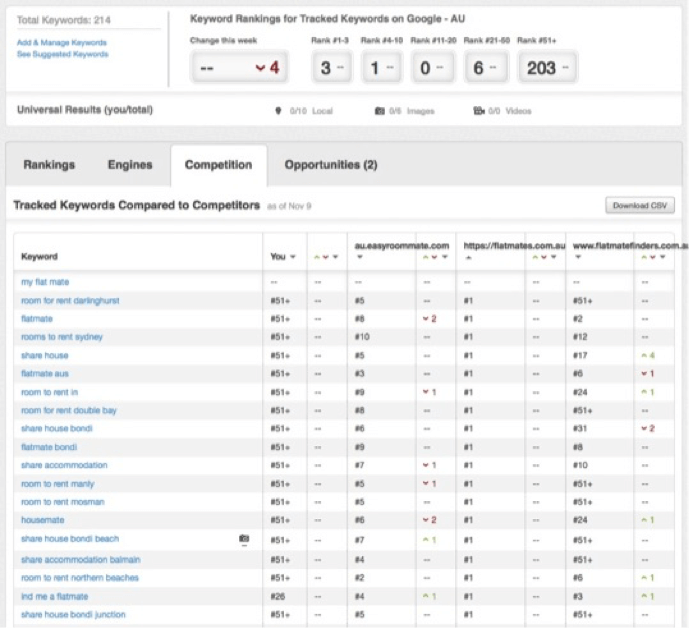 This find was supported by our first ranking report: out of 203 keywords that were tested; only three ranked within the first results (branded terms only) and only six ranked within the 21+-50 first results. Next, we analysed our client’s most significant competitors. We realised a major hurdle in reaching the level of links to match, as the competition had significant links directed to them both in number and reputation. The directing links included highly reputable websites which gave editorial mentions and links up to scale. So, what was our strategy? There are several link building techniques that we could have employed – however; that is not the point of this article (although if it is something in which you are interested, you could read this post [link to post]). Instead of a full sojourn considering all available techniques, let’s consider those that were used. Blog commenting can be a stellar technique – when done right. Superficially it appears easy, but this is not always the case. The trick is to find interesting conversations where you can do more than dip your toes; you need to make a worthwhile contribution and make it in the right place. In this case, we found a great site from the United States which offered services similar to our client and found a conversation in its chat forum. Some participants were looking for a similar website in Australia. This was obviously our opportunity: we participated in the discussion, we offered our solution and promoted our client’s site, and mentioned the link to our client’s site. Now, this particular US site has a huge domain authority of 95/100 which made any backlink precious. However, most importantly, our client since received 259 sessions from the link which makes the exercise more valuable than just than a typical SEO tactic; real traffic has been delivered on a constant basis. In addition to the above, we conducted a manual and personal outreach to several hundred very popular .edu sites, and example of which is www.eti.wa.edu.au. The website presents a ‘freemium’ model which allows all users to post ads on the site freely; from there these websites were delighted to link back to our client’s website. As it turns out, www.eti.wa.edu.au presents a staggering Domain Authority (a score reflecting how well a page will a page will rank on search engines) of 52/100. As such, the results were great on the SEO front, but the .edu website itself delivers a lot of traffic back to our client’s website. Working closely with a public relations consultant, we developed a strategy to ramp up our client’s PR. This involved approaching sites like domain.com.au, which of itself has significant clout, particularly in a market related to our client’s service. Our aim was simple: get our client’s website and brand face to become the go-to place for all matters of flatmate topics. Results were again encouraging in so far as Google was concerned, both on the SEO and link generation fronts. There are of course other techniques that could be followed, including niche directory submission, approaching a government website and affiliate partnerships. When it came to content generation, we created a blog related to the clients business. We invited users ranging between 18-28 years old to submit regular posts to our client which were then amplified using Facebook promoted posts and content delivery networks like Outbrain. 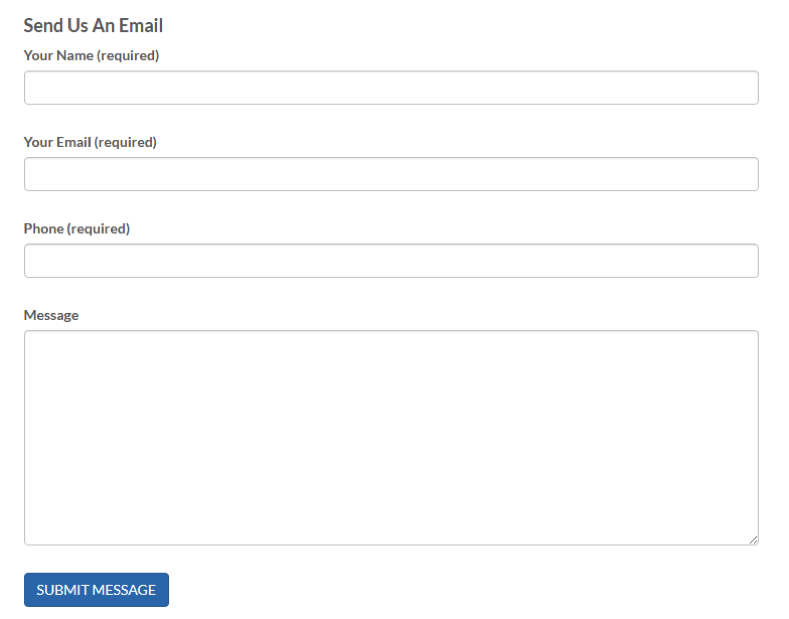 This earned our client links and shares, but also added fun, conversational touch to the client’s brand. Since we first started working on the client’s website the traffic has grown from latterly 0 organic searches to up to almost 2000 a month, again with a non-optimized site with more than 1200 broken links. The number of pages indexed by Google grew from 2 pages to 75 pages delivering traffic, not only in Australia but India and the UK. When the new site goes live (replacing the current site) we envision that all the gained authority produced by the link building will deliver ten times more organic traffic without even creating a single new link. We anticipate that the ROI will be impressive, and we’ll keep you updated.